Possible combinations of βαβ-units and Π-like modules in proteins in both right- and left-handed forms have been analyzed in detail. The correlation between the mutual arrangement of the structural elements in the polypeptide chain and their handedness has been shown. In the βαβΠ combinations, which is encountered most frequently in proteins, the Π-module follows the βαβ unit along the chain and both elements are right-handed. In the Πβαβ combinations, where the Π-module is located at the N end and the βαβ-unit follows it, the former is left-handed and the latter is right-handed. In relatively rare combinations of the left-handed βαβ-units and right-handed Π-modules, the βαβ-unit follows Π-module in the chain. The combinations of left-handed Π-modules and the left-handed βαβ-units are unobservable in proteins. It has also been shown that the Π-modules with a β-strand—α-helix—arch—β-strand structure are observed in proteins only in a right-handed form and half of them (51%) contains cis-prolines in their arches. These arches of nonhomologous proteins, as well as the positions of cis-prolines, nearly coincide when superimposed. The superimposed Π-modules also demonstrate that their overall folds are very similar. Structural alignment of their amino acid sequences has shown that the Π-modules have very similar sequence patterns of the key hydrophobic, hydrophilic, glycine, and cis-proline residues. Original Russian Text © A.M. Kargatov, A.V. 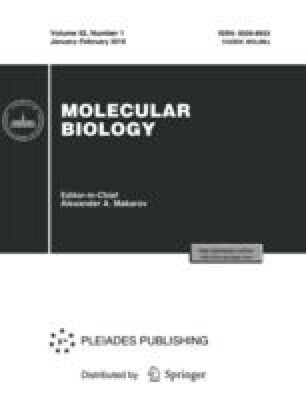 Efimov, 2018, published in Molekulyarnaya Biologiya, 2018, Vol. 52, No. 1, pp. 43–50.